Do not have to stop for them. Should honk your horn at them. You must yield to pedestrians at all times. If the pedestrians are jaywalking or crossing the street where they should not be, you must still stop for them. You should stop for other traffic. Traffic is entering from another road and you should allow additional space for drivers to merge safely into the flow of traffic. Traffic is entering from another road and you should keep right. 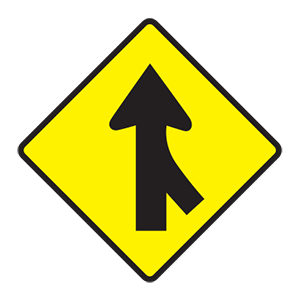 This sign alerts you to the possibility of traffic merging into the main stream of travel. After checking to your side and rear, you should move into another lane, if possible, to allow merging motorists a clear path. Which of these statements is true about roadwork zones? Fines are the same for violations committed in work zones as they are under normal traffic conditions. You must "Slow for the Cone Zone." Reduce your speed and be prepared to slow down or stop for highway equipment. Driving carefully through work zones improves safety for drivers, pedestrians, bicyclists, and road workers. Go through the intersection without stopping. Instructions given by police officers directing traffic always override posted traffic signals and signs. Follow the officer's instructions.